Use TB30DPB to reference this item. Attached to this token is a picture of Tod, one third of Team Rod & Tod w/Kaboom. 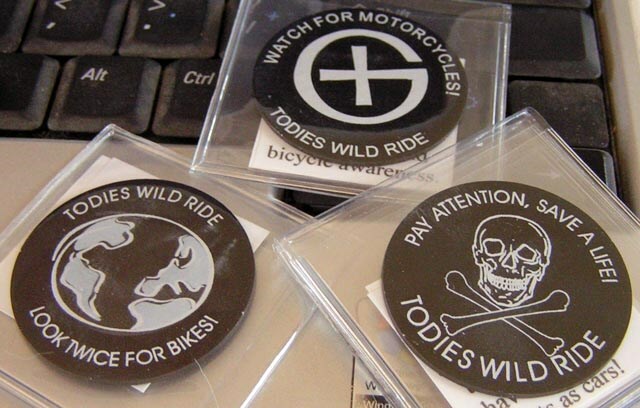 Tod was tragically killed when a vehicle turned in front of his motorcycle. He was not wearing a DOT approved helmet. Do you know someone who has been injured or lost in a motorcycle or bicycle accident? Please feel free to attach a laminated photo of them to this token! The mission of this token is to travel around the world spreading the word: PAY ATTENTION, BIKES ARE EVERYWHERE! This coin is part of the Todie's Wild Ride race to help promote bicycle and motorcycle safety. Please discover or move it but please don't keep it! Sorry for the late logging, I can't remember where I saw your tag, I just know I am going through a long list of codes and pictures. Thanks for sharing! I drive a motor scooter so I am sensitive to the subject matter. I am happy to take charge of this TB for a short while.